Reduce puffiness and sagging skin, and bring a calm, healthy glow to your face with these relaxing yoga poses. Nowhere do we see see more evidence of the natural aging process than when we look into a mirror. What once may have defined our identity is showing its true nature, and part of that nature is moving into the fall and winter seasons of life. Lines come, deepening their creases as we go through life’s inevitable challenges, marking us and changing us forever. But we have the choice of looking at the aging process differently! With the wisdom of experience, we can see that these lines do not define us. They demarcate the unique and private journey of our thoughts and experiences! Many of us turn to modern popular “solutions” of freezing or filling our lines, and these high-tech procedures may provide a temporary solace. But, if we cultivate the yogic principles of Santosha (acceptance) and Saucha (purity), the face relaxes and we see our skin soften and look younger. We cultivate a sense of Santosha or acceptance of the process of getting older and experiencing more of what life has to offer, both the good and the challenging. And we are also experiencing Saucha through a purification of our thoughts, a purification of our speech, and purification of our habits. For decades, yoga has been the go-to solution for many legendary movie stars such as Greta Garbo, Gloria Swanson, and Marilyn Monroe. Today both men and women are using this ancient technique to keep themselves vital, healthy, youthful, and glowing. Inversions are the secret weapon of every Zoomer Yogini! These poses move old lymph out and bring fresh lymph in, reducing puffiness and sagging skin. Lions’ Pose and other Ayurvedic facial techniques relax and tone muscles of the face and neck. 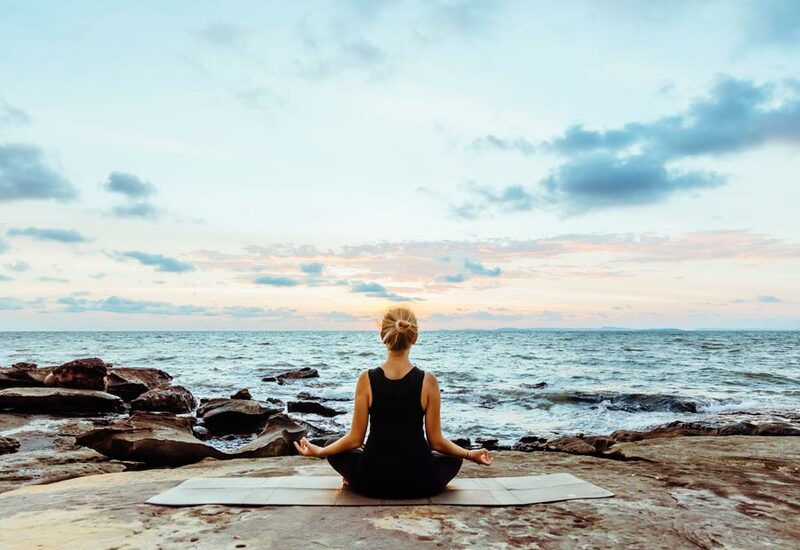 Our breath practices enliven every cell of the body with oxygen and prana, evening out our skin tone and giving us that youthful glow, or ojas, as it is defined in the ancient Sanskrit texts of yogas. Watch the Healing Yoga Webisode Extra below to learn how you can use different poses to maintain a calm, healthy glow. Look in the mirror and LOVE YOURSELF! This is an ancient yogic concept that Look for what’s right in your face and celebrate it! See any lines for what they truly are: experience and wisdom. See your grey hair as wisdom highlights! Every day before bed, write down a few things you are so grateful for and what went well! Congratulate yourself on everything including the foul ups, as they provide great lessons. Hydration is very important because our skin is dryer at this time of our lives, so try and consume at least two litres a day of room temperature water with lemon or cucumber. We can also benefit from adding more plant based fats into our diet. Avocados and nuts make excellent additions to our diet. Take cloth soaked in warm water and Abyanga self facial massage with oil. Find a pattern of moving your fingers across lines of tension and breath deeply into areas that are feeling more tense. Spend 15 minutes here with cucumbers cut in half moons on your eyes one resting on the browbone and upper part of the eyelid, and one under the eye. Let the cornea of the eye be free from any pressure. There have been reports that it also helps eyelashes and eyebrows grow back. Reclining Butterfly, (Supta Baddha Konasana) is an excellent way to spend time with soft music, and you can add a simple facial mask made of yogurt. Engage in Viloma Two breathing to help relax the nervous system and soften the face. Many people have had success with this traditional treatment.